The fashion industry is all about making statements and standing out from the crowd, so it’s hardly surprising that pioneering clothing brand MONSE chose a far from conventional location for its New York Fashion Week showcase. To tie in with an all-American back-to-school theme, peppered with collegiate sports references, the brand took over a basketball court in a new Manhattan residential tower to host their show. With MONSE’s logo – in the style of a school emblem – taking pride of place in the middle of the floor, the venue was ideal for showcasing this hot new label. 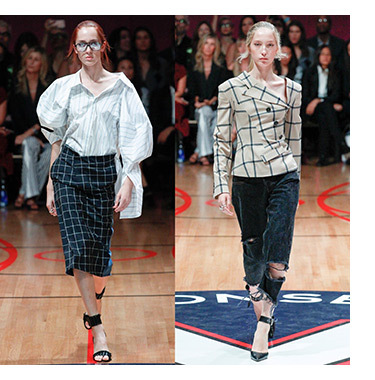 The rows of benches positioned around the outside of the room were packed with journalists, bloggers and fashion industry insiders, while the models used the court as a catwalk to show off MONSE’s Spring 2018 collection. In addition to a quirky venue, elegant models and a fantastic line-up of new designs, the other essential element of any fashion show is lighting. The models, and especially the clothes they are wearing, need to be clearly illuminated for all to see – both for the live audience and the photographers and video crews in attendance. For this the MONSE team contracted the services of experienced New York lighting designer Christien Methot and his company Design One Lighting Design to provide lighting that complemented both the venue and the theme of the show. Christien and his team designed and installed a lighting rig comprised almost exclusively of ADJ’s Inno Color Beam Z19 professional LED-powered wash fixtures. Featuring 19 x 10W quad color RGBW Osram LEDs, this compact fixture offers an impressive output of bright white or richly-saturated colored light. It’s motorized zoom function also offers a beam angle of between 10 and 60-degrees, making it a very versatile fixture that is ideal for a wide variety of applications. 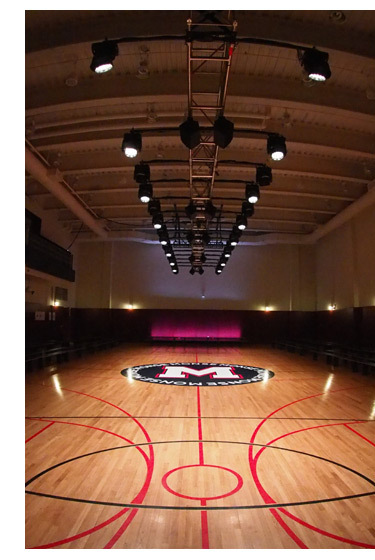 For the MONSE fashion show, Design One Lighting Design installed a total of 36 Inno Color Beam Z19s along the center of the basketball court to provide illumination for the models as well as the company’s logo. Christien programmed most of the Z19s so that they moved around the catwalk to inject energy and create the feel of a pep rally. Meanwhile, four of the fixtures were static at the end of the runway – two as front light and two as back light – to provide a sweet spot for the models to pause for photographs. This meant that they moved through a cacophony of light as they walked the length of the room, but then landed on a pre-determined spot in which they were perfectly lit to allow the photographers in attendance to get great crisp shots. The result was a show that had the energy of a pep rally while ensuring that the models were always suitably illuminated, both as they made their way up and down the runway and when they paused at the end. It also served as a great showcase for the ADJ Inno Color Beam Z19, demonstrating just how flexible a fixture it is.